Life is hectic this time of year! You have to gather Halloween costumes (and your kids change their minds a lot! ), bake tombstone-shaped cupcakes, decorate the house, clean up for the big party, and still stay on top of normal chores, errands, and oh yeah, work and sleep. Phew! How exhausting! Well, we can't help with everything, but we do have one quick fix that can help you feed two birds with one seed, if you will. These Pumpkin Lawn Bags are the perfect way to do double duty. You'll get to take care of the raking (check!) and decorate for the Halloween party (check, check!) at the same time. Having these festive pumpkins lined up along the hedge will add to your festivities, and will give you an extra incentive to get the lawn cleaned up before guests arrive. We call that a win-win. As for the tombstone cupcakes, we don't know how to help you, but we'd certainly love to try them! Just remember to leave an hour or two, just for you. We're quite certain you've earned it! 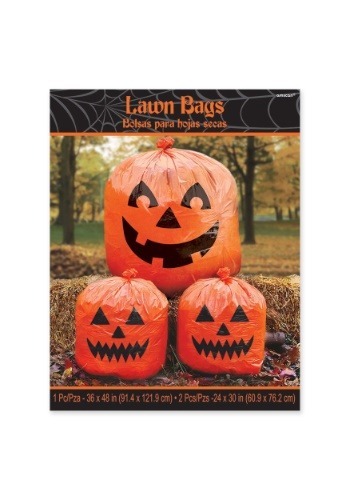 This set comes 3 bags per pack, and each bag has a jack-o-lantern design that will delight you and your partygoers. Grab as many packs as you need to add instant flair to your (leaf-free) lawn this Halloween! These bags are practically magic! Wow, we love that you're really into these lawn bags, but don't become one of those houses that gives them out in place of candy. They're cool and all—really cool, and helpful, too—but the kids still want their chocolate. Don't be that guy.